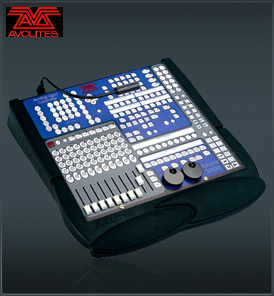 The Avolite Azure 2000 console has an awesome specification coupled with an aggressive price tag. Manufactured entirely in the UK by Avolites, a company with a proven track record and over 20 years experience in the concert touring industry, the console is set to be a clear market leader in the field of professional lighting control. The new console is primarily targeted at night-clubs and time-coded industrial shows. Additionally, the phenomenal power of Azure 2000 will make it ideal for environmental and architectural applications, theatre and television and any events requiring powerful moving and generic lighting control. Utilising durable, water proof membrane technology with tactile feedback, the console offers simultaneous control of 200 mixed intelligent fixtures and 200 dimmer control channels. It also has the power to run 20 separate Sequences or Environments at the same time! Unique features include 50 Direct Access memories and chases per page with 10 labelled pages, making it ideal for multi-operator situations. Chases may be run from multi-frequency sound-to-light triggers and timed overrides, programmed times or the 'Learn Tempo' function. Learn Tempo allows synchronisation of chases to the current beat by tapping the tempo button and thus entering the beat into the desk. To assist programming there is a pre-loaded Attribute Palette with up to 200 entries, giving instant access to all possible colours, gobos, beam effects and positions. The Palette may be applied to individual fixtures or to any of the 200 available groups. This enables the operator to build complex sequences and looks with remarkable ease. There are several standard features that would normally only be found on more expensive consoles; these include Align, Flip, Fan and full 3D tracking. Further value is added by the 3½ inch Floppy Disk Drive and the Colour VGA Monitor Output - which are both fitted as standard. In addition to the 500 memories or chases, the Avolite Azure 2000 includes 20 Environment programmes. Each of these may contain multiple sequences, running from different sound-to-light inputs as well as static memories and environmental control (e.g. neon, house lights, bar lights, etc.). The Environment programmes may be controlled from the internal clock, internal Time Scheduler or an external time code input. In keeping with the Avolites tradition of "hands on" rock 'n' roll control, the Azure 2000 is fitted with 10 submaster Playback Faders and two ultra-smooth metal shaft Optical Encoders. The familiar Avolites attribute 'Banking' system gives instant access to all moving light parameters at the touch of a button. The encoders, working in conjunction with the attribute banks allow immediate control override of any fixture parameter. The encoders or Graphic Tablet also enables full three dimensional pan/tilt tracking of moving light beams. To ensure the Avolite Azure 2000 is equally applicable to theatre productions, several pertinent functions are included to fine-tune the console for theatre use. These are 'Record Live', 'Live Time', 'Next Time', 'Review Cue' and 'Jump To (Cue Number)'. An important function for Playback Only applications such as night-clubs, is the Security Lockout feature. This is made up of 4 levels of coded User Authority, ensuring that untrained operators will not be able to corrupt pre-programmed shows. A number of different configurations are available to suit your particular requirement. The standard console is designed to drop into a 19 inch rack system or control booth counter top. The console can also be configured for stand-alone use, complete with ergonomic armrest and surround. Alternatively, the Azure 2000 can be supplied as a fully flight-cased Control System with integral Graphic Tablet and remote control. Avolite Azure 2000 can also be used in conjunction with the award winning Graphics Tablet to produce an unrivalled control system. 2,048 DMX channels - 4 full-speed DMX lines. 200 intelligent lights - full control of any mixture of fixtures. 200 dimmer channels - with soft patch, responce curves and HTP control. 20 sequences may be run simultaneously. Fitted with 3.5" floppy disk drive. Colour VGA output as standard. MIDI and MIDI timecode inputs. 200 Shapes, Groups and Palette entries. Over 100 fixture personalities supplied with console. Fluid resistant panel with tactile steel-domed switches. 50 Direct Access memories or sequences. 10 pages of memory available for multiple operator applications (e.g. festivals, nightclubs). 20 environment programmes controlled by real time clock, time code or manual selection. 4 levels of security lockout. 'Learn Tempo' for best beat synchronisation.